What a great start to November! We couldn't be happier for the loyalty our members have shown us so far this month. We are so appreciative for your membership. As a thank you from all of us here at Fly Casino, on Sunday from 00:00GMT until 23:59 GMT, all members are invited to claim a $/£/€40.00 bonus on your first deposit of $/£/€30 or more. 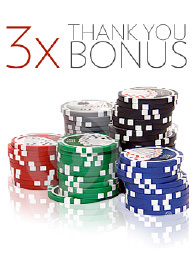 You may claim this bonus three times for $/£/€120.00. Thank you! On Sunday from 00:00GMT until 23:59 GMT, all members on their first deposit of $/£/€30 or more will receive a $/£/€40.00 deposit bonus. Claim it 3X! 133% BIG TUESDAY! From 00:00GMT until 23:59 GMT, all members are invited to receive a 133% bonus up to 133.00 on your first deposit of $/£/€ 30 or more.